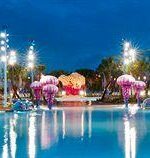 Super-sized and offering super value to families on a budget, Disney’s Pop Century Resort blends nostalgia for the year gone by with value prices of a bygone era. Opened in 2003 and with a room update completed in 2010, Disney’s Pop Century (or “The Pop”) is the largest of Walt Disney World Resort’s five onsite, value-priced lodgings. 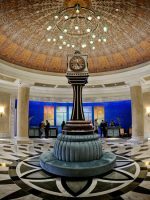 In fact, it’s one of the largest hotels in the U.S. Spread across 177 acres, the Wide World of Sports area resort contains 2,880 rooms in 10, four-story, icon-adorned buildings, each themed to personify a decade of the past, from 1950 to 1990. From the four-story Rubik’s Cubes adorning the 1980’s buildings to the gigantic Big Wheel festooning the facade of the 1970’s block, enormous 3D graphics appeal to visitors’ eyes, as well as their memories. As a value-priced accommodation, The Pop lacks some of the frills you might find in a Moderate or Deluxe Disney resort — like a marina, bike rentals and waterslides — but it still packs plenty of family appeal, with larger-than-life Disney theming, cool pools and dozens of fun photo ops that set the scene for a memorable central Florida vacation. 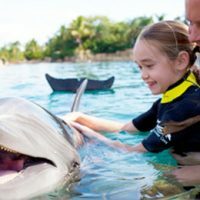 Plus, guests enjoy many of the same valuable, family-friendly amenities offered to overnight visitors at more expensive Disney properties, like early-entry and late-stay theme park privileges, onsite airline check-in, free Magical Express airport service and free transportation throughout Walt Disney World Resort. 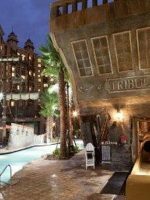 Accommodations are located in 10, four-story buildings, each themed to reflect a decade, from 1950 to 1990. Preferred rooms are those located closest to Classic Hall and the Hippy Dippy Pool -- you'll pay a surcharge of around $15 per night for this convenience. Alternatively, standard, quieter rooms in the 50's block are almost as close, and there is no added fee for many of these accommodations. All rooms contain two doubles or one king bed and sleep up to four, plus one crib can sleep a guest under the age of 3. There is an added nightly charge of $10 per adult when more than two adults occupy a room. For larger families, connecting rooms are available. All rooms are non-smoking. While on the small side (260 square feet versus the 314- to 340 square feet you'll find at Moderate Disney resorts), rooms at The Pop are thoughtfully designed, with bright furnishings, no jagged edges that toddlers might find troublesome and child-friendly touches like disposable plastic cups, rather than breakable glasses. A table and two chairs serve double duty as a dining area and desk, and in-room safes (among the largest we've seen on the Disney property) are roomy enough to fit a small laptop computer. They're located in an open-air closet in the vanity area, along with an ironing board and iron. Wall-mounted hairdryers are positioned adjacent to a single pedestal sink, and bath amenities by H2O Plus are standard in every room (bar soap and shampoo/conditioner combo only -- bring your own bubble bath). Mini-fridges and Wi-Fi service are complimentary, and the resort will deliver a complimentary Pack 'N Play or bedrails to your room upon request. Coffee makers are not available. It had been years since we stayed at Pop Century. The newly renovated rooms are a huge step up from the last time we where there. We found both the static bed and the fold down bed to be great. I really liked being able to put up the murphy bed when not in use, made the room bigger. The staff was great as always. On to what we did not like, the food at Pop Century is edible but unremarkable. There are not as many healthy options for vegetarians as there are at other Disney resorts. Drink options if you buy the mugs are disappointing--soda or tea, coffee. We bought refillable mugs for our kids but were disappointed that there is no juice or anything healthy that they could drink with them. Felt like a waste of money. Hoping in the future they add the Coca Cola freestyle dispensers that they have at other resorts. My advice for food would be to take a short walk over to the Art of Animation resort--better and healthier food choices. They even have smoothies. This was our second time staying at Pop since they updated the rooms. We had a larger party this time and arrive earlier than check in and the front desk was able to find us rooms. We had two rooms connecting via a door and a third adjoining room in the 80s section of the resort. The rooms were close to the transportation and had a pool right in front of the building. We only ate at the dining hall twice as the food selection doesn't change (opted for Downton Disney instead). Room was clean and we loved having the connecting room with my mom to allow the kids to pass easily between the two rooms. Highly recommend this resort for any stay, but be mindful that the rooms are on the smaller side. It didn't bother us much as we weren't in the rooms that much. Classic Hall is the center of resort activity and is home to Everything Pop (open 6 a.m. to midnight), a sprawling 5,000-square-foot retail space and adjacent food court with quick-service meals to suit a wide range of tastes. Each night at 6 p.m., Front Desk staff perform "The Hustle" in the lobby of Classic Hall, and each morning in the Food Court, kids can join dining staff in a local tribute to "The Twist." At other times, a DJ spins tunes in the lobby -- look for the strobe light and put in your request. Nearby, a Caricature Artist turns out 'toon versions of mom, dad and the crew. Souvenir sketch choices include face or full body in black and white or color. Across from Everything Pop is Fast Forward Arcade, a gigantic, super-bright game room. With more than 80 games, it's one of the largest and most kid-friendly arcades you'll find at any Disney resort. Among the three main pools, the Hippy Dippy pool, shaped like a flower and with petal shaped sprayers, is a favorite, but kids love the playful nature of the Bowling Pin and Computer pools, too. At the Hippy Dippy pool, guests can play Ping Pong on the pool deck, get a hair wrap ($2 per inch; beads extra) or pick out a temporary character tattoo (fee). Nightly movies are also screened at the Hippy Dippy Pool. Behind the Hippy Dippy Pool, a shallow Kiddie Pool with spraying jets and a padded deck provides a safe spot for little ones to play. Nearby, between the 1960's and 1970's sections, kids can get wet with Goofy in the Pop Jet Playground -- a silly water sprayground hosted by the surfboard-toting Disney dog. Swim diapers or rubber pants are required for non potty-trained children while using pools or water spray areas. These items, along with swim gear, sunscreen and pool noodles, can be purchased at Everything Pop Shop. Complimentary life vests are available at each pool. Pool and lifeguard duty hours vary -- check the chalkboard at the lifeguard stand for a current schedule. A traditional playground (recommended for ages 2 to 12) is located in the 60's section. Nearby, life-sized Twister games provide fun and photo-ops and in front of Classic Hall, hula-hoops, giant Legos and sidewalk chalk keep kids busy at the bus stop. Across from the registration desk, 50 themed display cases create a pictorial timeline of Pop Culture across the ages. 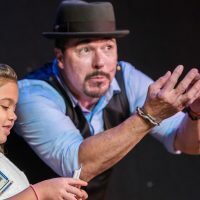 Parents and grandparents will especially enjoy sharing memories of classic toys and games, from Pick-Up Sticks and Play-Doh to Pet Rocks, Trivial Pursuit and Cabbage Patch Kids. Along Hourglass Lake, visitors can take a physical stroll down Memory Lane -- a paved path recalling significant moments in U.S., Disney and entertainment history. If you need to help a toddler burn off steam, or else lull a tired baby to sleep, a trip along the fact track should do the trick. 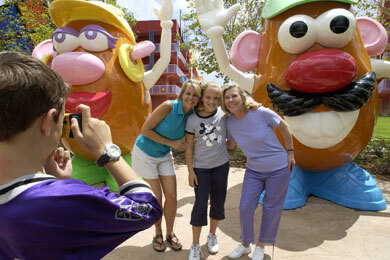 Throughout the resort, dozens of super-sized photo ops provide inspiration for family vacation scrapbooks, from a giant container of Play-Doh to colossal characters like Baloo, Tramp and the Potato Head crew. An expansive open-air space located adjacent to Everything Pop Shop, the food court offers a good variety of quick-service choices, comfortable seating with plenty of high chairs and lots of 3D eye candy, such as hovering Yo-Yos and dangling Rubik's cubes. Guests place their orders at themed food stations (Sandwich and Salad, Ethnic, Pizza and Pasta, Grill, Dessert), then carry them to a checkout area where cashiers process payment. At peak times (8 to 10 a.m. and 6 to 9 p.m.), it can get hectic -- if you can, dine early and avoid the rush. Disney Dining Plan Quick-Service credits are accepted. Signature items include Tie-Dye Cheesecake and Poppin Nachos Supreme. Other menu items of note include Mediterranean flatbread sandwiches; (try the Chipotle Shrimp Special); create-your-own tacos, burritos and salads; a variety of soups; and enormous ice cream sundaes. Beyond the requisite chicken nuggets and macaroni and cheese, kids 9 and under can order Mickey Waffles for breakfast, or spaghetti, a Sloppy Joe sandwich or hot dog for lunch or dinner. Kids meals come with 1-percent milk, apple juice or bottled water and two selections from a choice of carrot sticks, grapes, gelatin or applesauce. You can request cookies or a soft drink as a substitute, but we love that healthier menu items are standard, rather than the exception. Guests on the go will find a good number of wholesome snack options in a refrigerated Grab-N-Go section, such as melon cubes, mixed fruit, grapes, carrot and celery sticks and apple slices with caramel dip. For vegetarians, sides like hummus, hardboiled eggs and tapenade add wholesome variety. A refillable Souvenir Mug is a good deal if you're staying for two days or more. For use on Pop Century property only, it includes free refills on hot and cold drinks at Everything Pop Food Court during operating hours (6 a.m. until midnight). A popular spot both day and night -- try the Pina CoLava, a frozen mix of Bacardi RAZZ rum, raspberry puree and Pina Colada mix. For kids and teetotalers, the drink's non-alcoholic cousin, the Lava Smoothie, is a refreshing alternative. Open noon to midnight daily. The resort's own Peace of Pizza delivery service (4 p.m. to midnight) will bring a pizza to your Pop Century doorstep, by way of its cool VW delivery bus. Salads, wine, beer and groovy Tie-Dye Cheesecake are also on the menu. Overnight guests enjoy early-entry (one hour prior to opening) and late-stay (up to three hours after close) theme park privileges, plus the ability to make FASTPASS+ reservations 60 days in advance. Your Magic Band or Key to the World Card provides (room key) verifies access. Schedules vary. 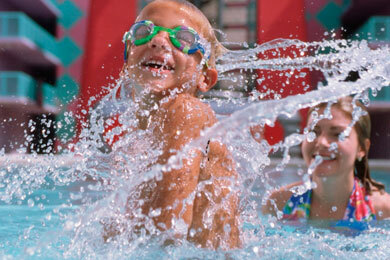 Kids Nite Out is the recommended provider of in-room resort childcare. Rates are $16 per hour for the first child, with a four-hour minimum and a $10 caregiver transportation fee. All About Kids provides similar services. Same-day valet service is available. Valet bags are available at Luggage Service. Coin-operated laundry rooms are located next to each of the three pools. Loads are $2 each and vending machines dispense powdered detergent, bleach and fabric softener ($1 each). If you're visiting The Pop Century with kids under 3, you'll need a stroller. Bring one from home, or rent or buy one upon arrival. Everything Pop Shop sells a reclining umbrella model for around $50. Local services that deliver include All About Kids, Orlando Stroller Rental and Owner's Locker. Dogs, bunnies and bears, oh my! Towel animals, courtesy of Mousekeeping, are a very popular feature of the hotel, as well as other Disney resorts, but keep in mind that their appearance is a surprise treat rather than a guaranteed amenity. If you're celebrating a special occasion, be sure to note it on your reservation, as well as at check-in time and at the concierge desk. Free celebratory treats bestowed upon Pop guests might include buttons, cards and character phone calls. Request at least 24 hours in advance. For families that don't want to be tied to dining reservations, Disney's Quick-Service Dining Plan provides more flexible options than the more deluxe table service plans, at a fraction of the cost. A number of options are available with the Magic Your Way Package. Save time by checking in online up to 10 days ahead. Upon arrival, present photo ID at Online Check-in desk and receive your Keys to the World. If you're arriving by car, shuttle or taxi, you can drop your luggage off at Classic Hall at check-in time. Luggage is delivered in groups, by room vicinity. Those utilizing Disney's Magical Express can expect delivery of luggage three to four hours after landing. If you're transferring to another Disney resort, the hotel will transport your luggage for you free of charge. Call Luggage Services for details. Even if you're not utilizing The Magical Express, you can still take advantage of onsite Resort Airline Check-in service (5 a.m. to 1 p.m., check in three hours prior to flight departure), which can be a huge help, especially for those traveling with small children. When traveling to Walt Disney World Resort, it's best to avoid peak travel periods. Generally, these times include holidays and the summer months -- in other words, any time schools are out of session. If you do opt to visit in summertime, pack sunscreen, hydrate frequently and, unless you want to spend your souvenir money on ponchos at the parks, don't forget your rain gear. 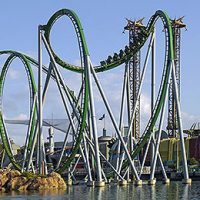 Fortunately for travelers on a budget, the least expensive times to visit Walt Disney World theme parks tend to coordinate with times when crowds are the lightest. 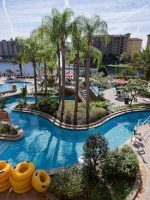 Disney Resort Value season --when room rates are lowest -- runs in January, February, August, September and early December (check for official dates). If your kids aren't in school yet, September is a great time to visit. Another prime time is after Thanksgiving through early December, when parks and resorts are decked out in holiday splendor. 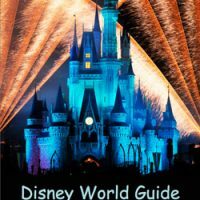 Free roundtrip airport transportation from Orlando International Airport (MCO) via motorcoach is available to guests (advance reservation required; limited hours) via Disney's Magical Express. Free transportation to and from Walt Disney World theme parks, water parks and Downtown Disney is provided by bus. A covered bus stop is located in front of Classic Hall. Unlike other Value Resorts, which share transportation services, Pop Century has its own bus. The average wait time is 10 to 20 minutes. To reach the resort by car (approximately 30 minute drive), take the South Exit Road from Orlando International Airport to SR 417 Toll Road (GreeneWay), west and follow signs to Walt Disney World/Disney's Pop Century Resort. Plan on about $3 in tolls. For a fun night out, head to Downtown Disney. Top stops include Raglan Road for music and a pint, Wolfgang Puck Cafe for dinner and Ghiradelli Soda Fountain for dessert. Closer to home, you can catch a game at ESPN Wide World of Sports Complex. The state-of-the-art facility is the site of Spring Training for The Atlanta Braves, as well as many other ticketed professional and amateur events.